The day I spent prepping meals for the freezer was certainly a long one. I was 38 weeks pregnant with swollen ankles and general exhaustion. But my nesting urges/energy helped me push through. Then when it came to making the very last thing and suddenly my energy was gone. I wanted so badly to just leave the kitchen (and the mess!) and hit the couch. But it was close to dinner time and I knew we would need to eat anyway, so I decided to make a large batch of dinner and freeze half of it. Then I could kill 2 birds with 1 stone. I am so glad I pushed through! While I’ve made a lot of versions of stuffed shells, I have to say that these were by far my favorite. I think I finally got the perfect ratio of ingredients to make a flavorful filling that’s not dry and really hits the spot. I’m also happy to report that the portion that was frozen was just as delicious! Preheat oven to 375 degrees. Prepare a 9×13* baking dish by pouring 1 cup of marinara sauce into the bottom of the dish and spreading around. Set aside. Bring a large pot of water to a boil and cook according just a minute or two less than the directions on the box (this will make them easier to handle/fill, don’t worry they will finish cooking during the bake time). Drain and let cool for a minute. While the noodles are cooling, combine the ricotta, egg, Parmesan cheese, Italian cheese blend, chopped basil, spinach, chicken, salt and pepper. Using a large spoon, fill the cooled shells with the filling. Place the filled shells in the prepared baking dish. 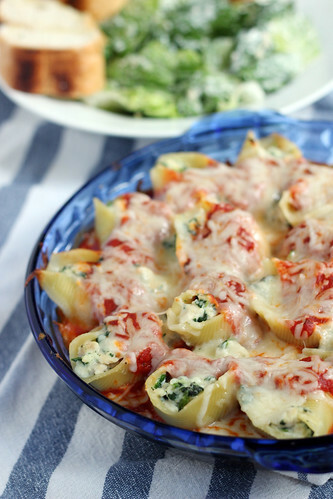 Top shells with the remaining marinara sauce and sprinkle with 1/2-3/4 cup of Italian cheese. Tightly cover baking dish with foil and bake for 30 minutes. Remove the foil and continue baking for 10-15 minutes, or until cheese on top is melted and bubbly. Serve with a side salad and garlic bread to make a deceivingly easy delicious meal! *Instead of a 9×13 pan you can divide the recipe into 2 pie pans or smaller baking dishes, which is what I did. **For freezing, make recipe as written but instead of baking, cover with plastic wrap and then 2 tight layers of foil, then label and freeze. When you’re ready to bake, it can go straight in the oven with an extra 15 minutes or so, just don’t forget to remove the plastic wrap first! 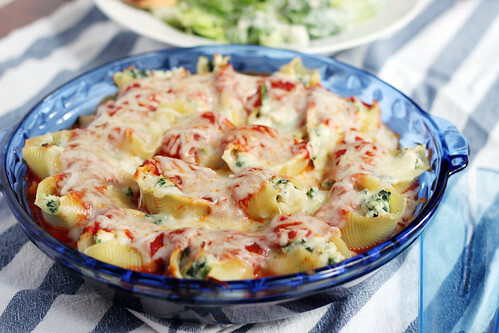 Other deceivingly easy, delicious pasta dishes! Who doesn’t love a good freezer meal? These look great, Jess! Ohhh man, I need these stat!!! I Just found out that I am pregnant & due this fall. I am going to be Much more proactive with this baby & make 6-8 weeks worth of make-ahead dinners. That way dinner is simple, quick & still delicious. How long do you think it will it keep in the freezer? I would probably keep something like this in my freezer for 2-3 months. But to be perfectly honest, nothing I prepared ahead of time made it that long! I’m a little confused about how long you cook it after it’s frozen. Just 15 minutes total? or the original directions (30 + 10/15) PLUS an extra 15 minutes? Thanks! You might need an EXTRA 15 minutes (so closer to 50-60 minutes TOTAL). Good luck!